“Ye Akashwani Hai Abhi Aap . . . Se Samachar Suniye”, “Namaste Bhaino Aur Bhaiyon Mein Aap Ka Dost Ameen Sayani Bol Raha Hoon”, “Jaab Jeeturaj Bolta Hai Tho Akha Mumbai Sunta Hai” words like these remains committed to the ears of many radio listeners of all ages. Till the advent of television or mobile phones radio ruled the entertainment industry in India. Be it listening to the news, sports commentary or your favourite songs over the radio at your home or while having hair cut at your very own barber shop radio remained the most popular and effective medium of entertainment for the common masses. Radio in those days meant All India Radio (AIR) on the AM band. The real decline of the radio popularity was witnessed within Indian households during 1991 when cable and satellite television made their entry into the Indian markets. However, Indians were once again captivated back to radio listening when private commercial FM stations started operating in India at the beginning of the twenty first century. But, how many of us know about the history of radio in India, the different types of radios services, different formats of radio or your audience research that makes the program on air equally popular, effective and entertaining. Debut author Pankaj Athawale has recently come up with his first book titled, “Stay Tuned” (The Story of Radio in India) published with Indus Source Books which would address all of these questions not only from the angle of curiosity of readers but would also address the under graduate and post graduate media course students across the country. 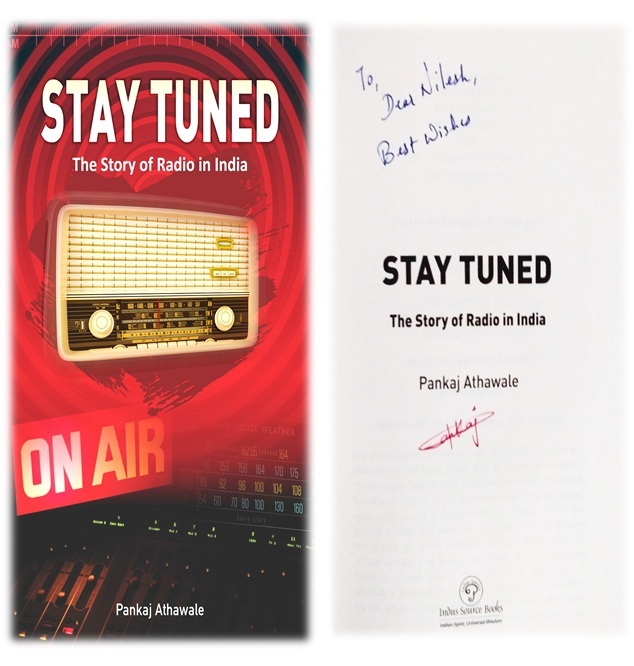 Author, Pankaj has been hosting radio shows on All India Radio’s FM stations. He also holds the credit for having the cricket commentary for various bilateral series, World Cup and ICC Championships. During his stint with the radio he had the opportunity to interview many national as well as international dignitaries apart from sharing the microphone with stalwarts like Sunil Gavaskar, Clive Lloyd and Kapil Dev and many more. What I liked about the book is the author has dedicated one full chapter covering each topic at length. The chapter “Radio Services” talks about All India Radio, Private Commercial Radio (FM) in India, Community Radio, Satellite Radio and Internet Radio. While the chapter “Radio Formats” gives the reader detailed insight about the various formats the broadcaster of the radio show needs to adhere to. So for news the format is different, for radio drama the content is different, sports broadcast has its own rule and the protocols one needs to adhere to while addressing shows for the President or Prime Minister of our country the formats are different. The author admits he has been fortunate enough to get the opportunity to work on such formats across various stations over the years. Reading the book I realized radio is just not meant to be synonymous with music. In fact there is lot more that happens behind the scene. Unlike the television or print media the radio is a different ball game all together. Who is listening to your show or how many are listening audience research like this is not possible in real time. Radio has to depend upon conventional methods to do the quantitative analysis of data. Best approach being to take a sample and analyze the responses given to the questionnaire from the voice of your readers. Readers if you have any more questions that has amplified your curiosity about Radio as a subject I would recommend you to read, “Stay Tuned” (The Story of Radio in India).